Gilbert was born about the 10th May 1291 near Tewkesbury, Gloucestershire. He was the only son of Gilbert “the Red” de Clare, and his second wife Joan of Acre, daughter of King Edward I. The de Clares were rich and powerful, and held their sway over 23 counties across England, Wales and Ireland. Gilbert was but a minor when his father died, and he became a ward of his stepfather, Ralph de Monthermer. He was given seisin of the de Clare lands at the early age of sixteen by his uncle, the newly crowned Edward II. His knighthood swiftly followed. 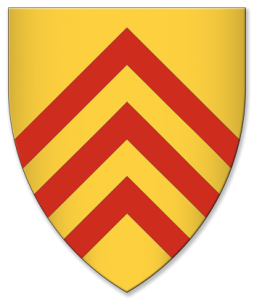 Gilbert was keen to carry on the family militaristic tradition and, by 1308, he was off on campaign in Scotland, where he was appointed warden of Scotland, and then captain of Scotland and the northern Marches. He was respected and trusted by the king – despite some involvement in the downfall of the latter’s favourite, Piers Gaveston – and was rewarded with two terms as Guardian of the Realm. Sadly Bannockburn brought an end to a promising career. Sir Gilbert had command of the front line in conjunction with the Earl of Hereford. In a skirmish on 23rd June 1314 he was knocked off his horse. Later that day he suggested postponing the next stage of the battle but the King accused him of cowardice. This may have provoked young Gilbert into impetuosity as, next day, he charged into battle before his companions were prepared. He was again knocked from his horse and, this time, was killed. Some accounts say that such was his haste that he failed to wear his coat of arms that would have identified him as a means of ransom with the Scots. Gilbert was buried in Tewkesbury Abbey. He left a widow, Maud de Burgh, a sister of Robert the Bruce’s second wife, but no children; his vast inheritance had to be divided between his three sisters.